Grandparents are those unique individuals who allow us to be who we are without having any expectations of who we should become. Their accumulated wisdom helps us understand what truly matters in life. 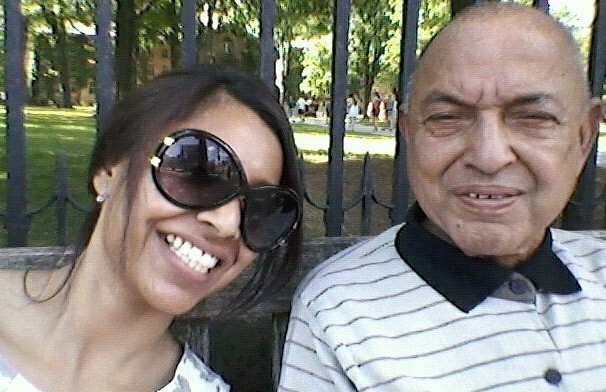 Growing up in India and then later in England and America, I was the closest to my maternal grandfather, Nana. Nana, Gyanendra Nath Verma, came from a small poor town of Barabanki in North India. At the age of 18 he moved to a larger city of Allahabad in search of higher education. Nana’s humble beginnings consisted of delivering newspaper in his neighborhood, studying under the streetlights, surviving on a minimal diet, and tutoring in between his classes. He overcame all the impediments and successfully became a lawyer, had a thriving career, and left a legacy in his name in Allahabad. 1) Work hard, Play hard: Nana had worked extremely hard for his career and took his work very seriously. However, he knew the importance of balance in life. His adventures, functions, and travels complemented his hard work and thriving career. 2) Always make time for yourself: In the midst of his busy day, I would often catch him sitting alone soaking in his own company. He was reenergized and rejuvenated when he spent time with himself, and he truly taught me the joy of enjoying ones own company. 3) Always spend quality time with others: He always made my brother and I a priority no matter how packed his schedule. He was a man of his words and people could always count on him. He celebrated the good in his loved ones lives, but more importantly was always there for their trials and tribulations. And Nana always managed to make friends while traveling the world. It is because of Nana that I understand the sacredness of a human connection. 4) Live from the heart: Nana lived life on his own terms. Others may have not agreed with his decisions in life, but he knew he was not here to live anyone else’s life, but only his very own. 5) Travel the world: Every summer Nana would pack his suitcase and embark on colorful adventures. His life was saturated with experiences of different cultures and people, and he always had interesting life stories for our coffee and dinner dates. 6) Have a morning routine: He woke up every morning at the same time, went on his daily walk, and always had breakfast before leaving for work. I later realized that his morning ritual is what had set him up for a fruitful day, every single day. 7) Don’t follow the crowd: Nana had several brothers and sisters out of whom he was the most successful and abundant in life. He lived a very unorthodox life by Indian standards and never looked around to see what others were doing. He paved his own path and danced to his own tune. This unique approach to life inspired me to fully understand who I am and never apologize for it. 8) Help others: I had always seen the generous side of Nana, however at Nana’s funeral my family and I were astounded by all the people who came forth with their stories of how Nana had impacted their lives. Whether it was paying for their children’s education, helping them establish a career, donating to the orphanage, or just helping a friend in time of need, Nana’s generosity was unbounded. Nana helped me recognize all the things we accumulate in life are not ours to keep; when we are gone they stay behind, thus we might as well give them away while we are still here. 9) Laugh a lot: A LOT. And don’t ever stop. 10) Believe in handwritten notes: Growing up in England and America Nana’s handwritten letters came weekly. As children my brother and I were encouraged by our mother to respond to Nana’s letters. Whether we talked about our birthday gifts, how great or rough school was, or just updated Nana on our viral infections and runny noses, our letters to each other were rich in emotions, filled with experiences, and bridged the distance we had between each other. Nana is the reason why I believe in the beauty of hand-composed notes. Nana became an integral part of who I am today, because I had the honor of witnessing his life firsthand. I spent countless hot Indian summers in his company and explored several countries with him. Through Nana I understood the significance of adventure, hard work, independence, and open-mindedness, as well as the richness of close family and friends. Our grandparents never leave us, they continue to live because so much of them is reflected in us. The eleventh life lesson I have learned is the most crucial one. Grandparents open your eyes to the scenery that calls your name, they free your thoughts to help you understand who you are, and they impart their life lessons so you don’t have to learn it the hard way. If one is fortunate enough to have a grandparent in their lives, one must bask in their company, as no one else can impact your world the way a grandparent can. Originally published at www.huffingtonpost.com on May 14, 2017.